Our Hymer B578 is a luxury camper 4 person camper, each seat is equipped with safety belt and there are 4 complete berths. The sleeping places are divided into 2 groups, for the car a double bed and at the back of the car 2 x single bed, can also be changed into a very spacious double bed. The seating area remains intact at night. The kitchen is well equipped with a fridge-freezer and oven with grill, a large loading block, 3 burner gas cooker. The freeze-cooling combination independently chooses the currently determined energy source 12 volts, 220 volts or gas. The entire interior exudes luxury and solidity. Of course there is also a lot of storage and storage space available. 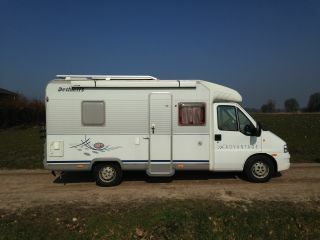 Staying in the camper is of course important, but it is equally important to drive this motorhome. 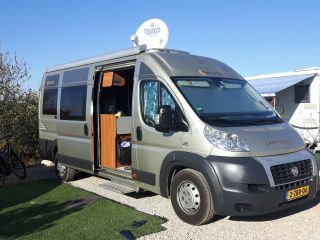 This camper is equipped with a 6 speed automatic gearbox combined with a fine 3 liter diesel engine. The relatively large engine combined with the automatic gear ensures smooth handling and driving comfort. The camping equipment is based on an occupancy of 4 people. The camper is both inside and outside clean delivered to you. If the motor is reduced, it must inside and cleaned out. The waste tank has to be empty and the toilet cassette is empty and being cleaned. When cleaning is left to us, which can whenever you've reported before departure, then we can do that, but we calculate inside and outside of € 75.00 per share. These amounts are possibly deducted from the deposit. The drive from 12 volts to 220 volts produces up to 300 watts and is protected up to 300 watts. That means that this system is only suitable for charging electronic devices. The use of electricity consumers, which include more than 300 watts such as kettle, electric heater, the hair dryer, the oven and other power users is only possible when the motor is connected to the power supply of the campsite or motorhome. Repairing the inverter and that the 12-volt circuit is the responsibility of the tenant and will be deducted from the deposit. The camper is delivered with full fuel and needs to be with again return off tanked. If the motor does not tanked is handed down, the landlord will arrange for refueling, the fuel amount + fee of € 20.00 will be deducted from the deposit. The consumption of gas, butane / propane, is included in the rent. The canopy must be turned in every night. This also applies if you are not in the daytime at the camper. This is to prevent unnecessary damage to the awning and camper. Any damages to the awning on behalf of the tenant and must be reported to the landlord, and will be settled after consideration by the dealer with the deposit. Damage both inside and outside should be reported immediately. Response from Ruud Vanaf het begin gingen de contacten over en weer zeer soepel en plezierig. Remco is een goede huurder, de wagen kwam in prima conditie terug. Wanneer Remco in de toekomst nogmaals wilt huren, en de wagen is beschikbaar, dan behoef ik niet na te denken. Het was gewoon fijn om met hem zaken te doen. Response from Ruud Vanaf het begin heb ik met Corné een goed contact gehad. Ik vind het voor hem en zijn kinderen fijn dat zij een heerlijke vakantieweek beleefd hebben, en dat onze Carado daaraan heeft bijgedragen. De camper kwam in prima staat terug. Corné is en was een fijne goede huurder, die ik een volgende keer zonder meer de Camper verhuur.